Manufactured in the USA, Excel Hobby Blades feature precision, high-grade steel. All blades are double sharp and double honed. #11 — Fine angle, for deep cuts. Fits Excel K1 aluminum handle, and other knives that take standard #11 blades. #11 Stainless Steel — Great for trimming paper, plastic, wood, and leather. This super-sharp blade fits Excel K1, K3, K17, K18, K30, and K40 knives, as well as standard light- to medium-duty craft knives. 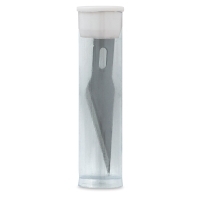 #16 — Narrow tipped blade for use with thinner materials. 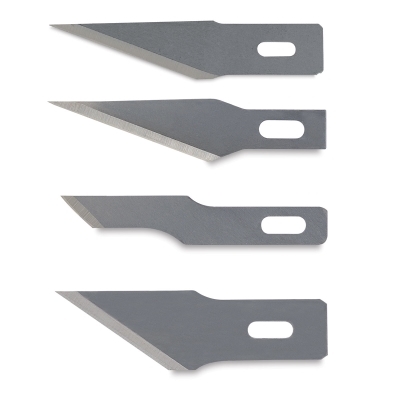 Fits Excel K1 aluminum handle, and other knives that take standard #16 blades. #24 — Sharp angle trimmer. Fits Excel K2 aluminum handle, and other knives that take standard #24 blades. 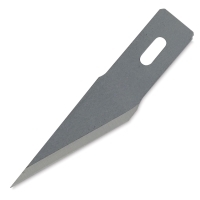 #2 — This straight edge blade is perfect for trimming and scoring wood, plastic, paper, leather, and more with ultimate precision. 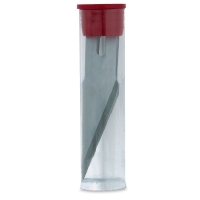 It fits Excel K2, K5, and K6 knives, as well as standard medium- to heavy-duty craft knives.